This beautiful original concept art drawing from Ichabod by Mary Blair is curretly available on Van Eaton galleries. I just love to start my day by discovering beautiful pieces like this one. I knew the posters thanks to ebay, but Devyn Marseilles just discovered the actual short on Google Videos. Enjoy by clicking on this link! 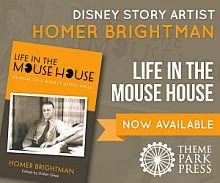 Art came to Disney's in 1940, and worked at the Mouse House his entire career. A longtime assistant for John Lounsberry, Art was elevated to feature director on The Rescuers when Lounsberry died. He ended up the lead director on The Fox and the Hound and finished his career with The Black Cauldron. I worked with Art on Fox and the Hound, and thought he did a commendable job in pulling the film together. (During its making, half the animation crew departed, and there was some fierce infighting among the directors.) That the feature turned out as well as it did is much to Art's credit. 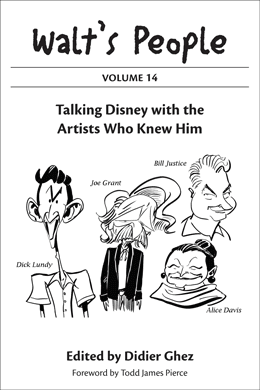 An interview with Art Stevens conducted last year by Pete Docter is should appear in Walt's People - Volume 7. [At a Cartoon Arts Professional Society (CAPS) event in Los Angeles in the Eighties that I attended, cartoonist Roger Armstrong shared the following story about how he got the job of drawing the Scamp comic strip. So I went in and talked to Don McLaughlin and he had these other fellows there and they sat around and looked at my samples. Finally, Don said, 'Can you draw Mickey Mouse?' I said, 'Absolutely not. I couldn't draw Mickey Mouse if my life depended on it.' There was a pause and then he said, 'Good, you're hired.' It was just a joke on his part, I guess." Armstrong also shied away from drawing Donald Duck and Uncle Scrooge. "I couldn't draw them at all." Although Armstrong did draw some stories of Super Goof and the Beagle Boys. I was fortunate enough to buy two original Scamp daily strips and have Armstrong autograph them. - Unbuttoned by Jim Korkis and Michael Barrier on MichaelBarrier.com (posted on June 27, 2007). Larry Clemmons by Vance Gerry. Larry Clemmons will be featured in Walt's People - Volume 6. I just found out that the release date for Hans Bacher's book (English version) is now officially October 2007. Hans Bacher used to be one of Disney's most prominent art directors during the "new golden age" and was the main artist responsible for the beautiful look and feel of Mulan. 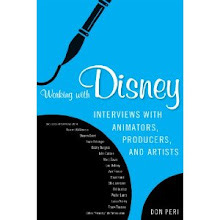 Can't wait to put my hands on his book on production design in animation. While browsing last week, I just stumbled upon this new book. - Pete Emslie (author of the Walt's People covers) has started his blog. 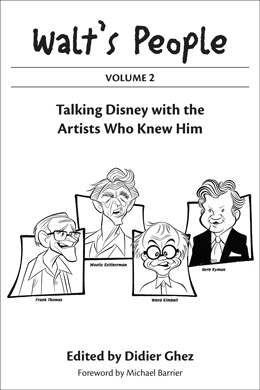 - More on Walt Disney and T. H. White by Michael Barrier in post from June 23, 2007. - Podcasts with Lella Smith, Bruno Girveau and Andreas Deja at FPS Magazine. I just found out that David Koenig's upcoming book, Realityland, is now available for pre-order on Amazon.com. I thought that news might interest some of you. I have asked David to write a text for the blog to present it. I am hoping to receive his answer at some point next week. Cartoon Brew mentioned yesterday an exhibition about Kay Nielsen currently taking place in Copenhagen until August 19. I am wondering if a catalog has been released for this exhibition. Would any of the Danish-speaking readers of this blog (Hans?) be willing to email the GL. Holtegaard museum to find out? 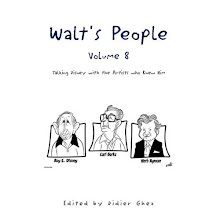 It's official: Walt's People - Volume 5 has now been released on Xlibris.com. It's huge and I have no doubt that this is the best volume to date and will be extremely difficult to top. 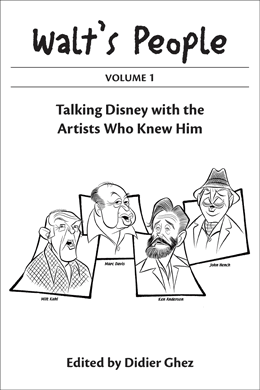 It contains the first part of the never-released-before interviews conducted by Richard Hubler in 1968, two extremely in-depth interviews by Rick Shale about the WWII years, various interviews with Disney background artists and lots more. It will also be available through Amazon in about 2 months, as ever. If you have blogs, mailing lists or web sites, please do spread the news! I need your help. 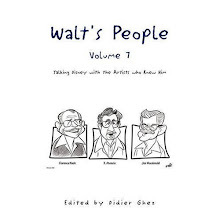 I am preparing a list of all the articles written by Izzy Klein for Cartoonist PROfiles to be included in Walt's People - Volume 6's bibliography, but I am missing quite a few issues. I am trying to find out what was the subject, title and publication date of the articles he wrote for issues 16, 20, 32, 38, 39, 41, 43, 45, 46, 50, and 67. A Letter from Ward Kimball by Will Finn and while you are on Will Finn's blog (which just made it to my list of permanent links), also check out John Musker, Animator Whisperer. Ron Miller by Vance Gerry. - Andreas Deja : " ... If you take the drawing out of Disney, it just isn't Disney"
[I enjoyed Jim Korkis' article on your site a few days back. Very little has been written about Bruce Bushman, but he was central to the development of Disneyland. He was one of the few animators who transferred over to the WED design team in 1953 and 1954. He was a large man who enjoyed playing Santa Claus for various charities. Each Christmas he spent many days inside of an elaborate Santa's Village. And perhaps through this experience, he developed an intuitive sense of how children would respond to created fantasy environments such as those Walt Disney hoped to build at Disneyland. To a great extent Bushman was responsible for the overall "look" of Fantasyland, developing a cohesive color palette for the area and focusing his attention on how the various rides might create a unified presentation. Some of my favorite Bushman designs were never built, such as the Pinocchio boat ride. In the Pinocchio boat ride, guests would float by scenes from the film, before finally plummeting out Monstro's mouth, whose extended tongue was arranged as a 30-foot flume sending flat-bottom boats down to a large splash lagoon. It was an imaginative version of the popular "shoot-the-chutes" boat rides found at many beachside parks in the 1950s. But the real reason I'm writing is to share some artwork. After leaving Disney, Bruce Bushman helped design a number of non-Disney theme parks. In Jim Korkis' article, he included a link to Dan Goodsell's wonderful blog which included some scans of artwork for the proposed Hanna-Barbera Land. Dan's blog has some fabulous images of rides fashioned after the Jetsons and Yogi Bear's Jellystone Park. But I wanted to send along two images for the proposed Fred Flintstone ride. (I know one Flintstone image is on Dan's site). But in these two images, you can see both the overall track design for the Flintstone ride and also the vehicle design. It would've made for an interesting park. - Fantasia Leica 2 by Michael Sporn. This comic book album of Astérix has just been released in France to celebrate Albert Uderzo's 80th birthday. 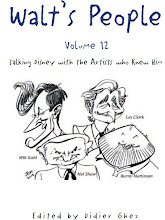 It contains tributes to Uderzo by most of the main European comic book artists, including Disney comic book artist Vicar, who created a special 3 page story where Donald and the nephews meet Astérix and Obelix for the first time. 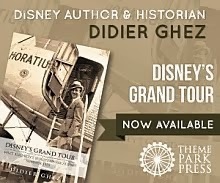 I have updated The Disney Books Network this weekend. [On Sleeping Beauty, I was invited to go with Walt to this hoity-toity party in San Francisco. It was a men’s club, no women, and was very expensive and prestigious. Presidents of companies. That sort of thing. It was all in honor of Walt and Sleeping Beauty. I had the honor of going along and drawing whatever Walt said I could draw. They gave him this award, this prize that looked like a burnt turkey on a pedestal with its legs sticking up in the air. It turned out the artist was there and he came up and met Walt and they began talking and laughing. He and the artist became close friends right away like they understood each other. Everyone else in the room was just looking goggle-eyed at them. You may remember that about a month ago I mentioned on the blog the upcoming book: Stepping Into the Picture: Cartoon Designer Maurice Noble. I just realized that this book is not "just" a biography of Maurice Noble, it is apparently his autobiography co-written with Robert McKinnon, which makes it even more exciting. Both MichaelBarrier.com and Mark Evanier's site report the death of artist Roger Armstrong last week at the age of 89. 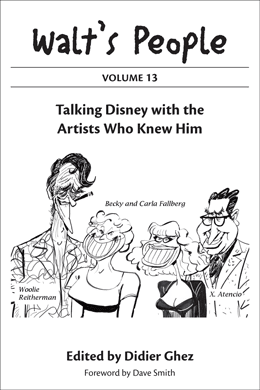 An interview with Armstrong by Alberto Becattini has been featured in Walt's People - Volume 4. I had an excellent surprise yesterday. A project I initiated 2 years ago and that I thought was long dead seems to be back on track with a vengeance! Since I am based in Spain, I have been trying for a while to get Disney to organize an exhibition about Disney and Spain, in Madrid and Barcelona. It looks as if we might have finally found the financing for the project. It still is months away, of course. Now here is my question to all of you: What would you include in such an exhibition? Have I forgotten obvious projects and ideas? For those of you who have not seen it yet, the new issue of The E-Ticket magazine (number 45) has just been released. It's not yet featured on the web site, though, for some reason. I will be in Paris tomorrow. The site will be updated again on Thursday. 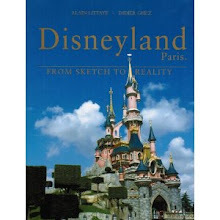 I got a chance this last week to spend some time with Todd Pierce on the faculty at Cal Poly who is working on a book on early Disneyland and other theme parks and we talked about some of the early Disneyland Designers like Harper Goff, C.V. Wood and Bruce Bushman who went on to work on other non-Disney theme parks. Bruce Bushman (1911-1972) began work at the Disney Studios as a layout artist on the short cartoons although he also worked in other capacities including Art Director of the Mickey Mouse Club tv series and Art Director for the Nutcracker Suite segment of Fantasia. He worked on attractions for Disneyland from the beginning including the horses for the Disneyland Carousel, Casey Jr. Circus train, Phantom Boats and the Mickey Mouse Club Circus.. Bruce was a large, husky man and Walt decided that his proportions would be used as a guide for the seating on the ride vehicles like the Snow White ride. He was the son of famous silent screen star, Francis X. Bushman. He has a window on Main Street at Disneyland. In the Fifties, Nat Winecoff, former Disney promoter and theme park developer, conceived of a $15 million Bible story-based theme parkwhich he planned to build on 220 acres of land in Cucamonga (now Rancho Cucamonga). Investors included actor Jack (Wizard of Oz Tin Man) Haley and Donald Duncan of Duncan Yo-Yo fame. However, the clergy allegedly quashed the idea and Bible Storyland was never erected. To be constructed in the shape of a heart, Bible Storyland would have included different “lands,” each with its own theme, tied to either pre-Christian times, the Bible or the New Testament. Parkgoers would arrive at a Star of David garden and could then saunter through the Garden of Eden and visit Adam and Eve. Visitors could also venture to Israel and ride animals through Noah’s Ark Carousel, explore the inside of the whale with Jonah and watch Moses on Mount Sinai. Other locales would have included ancient Egypt, Babylon and Rome, as well as Ur, where Abraham began his journey to the Promised Land. It would have featured rides and attractions such as “Adventures in King Tut's Tomb”, “Noah's Ark Carousel”and “Ride Through King Solomon's Mines”. Would a reader of this blog have access to John Canemaker's article titled Disney Backgrounds that appeared in the magazine Print from Mar/Apr 82? 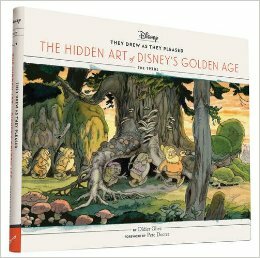 I am trying to get a scan of it as Walt's People - Volume 6 and the volumes after it will feature a few pieces about Disney background artists. By the way, if you live in Europe, you could meet Andreas in Hamburg on June 29th, instead of LA the week before that (see below). Van Eaton Galleries is organizing a special Andreas Deja evening on June 21st. For all of you in LA this is clearly a "can't miss" event. Is there a better way to start the week than with a totally unknown photo of young Walt from the collection of Mark Sonntag? This one is from Swope Park, once more. - Two model sheets by Rico LeBrun posted by Michael Sporn. Final pages of the 1951 annual report. - Tinkering by Mark Greif (thanks to Tim Gallaher for this link).